Join us for our series of Autumn Workshops! We’re well into our programme of Autumn 2014 workshops! We’ve explored the ideas of drama and spirituality through our artistic director Sharon Muiruri. Next up are rehearsals for a short performance of Oh What A Lovely War which The Poole Passion have been invited to perform at this years Carols By Candlelight service at St Peter’s Parkstone. For a full list of dates and times, visit our online calendar here! The Poole Passion on ITV Meridian News! Being part of a play is a very exciting and challenging task for anyone, but even more so when you are just 9 years old. 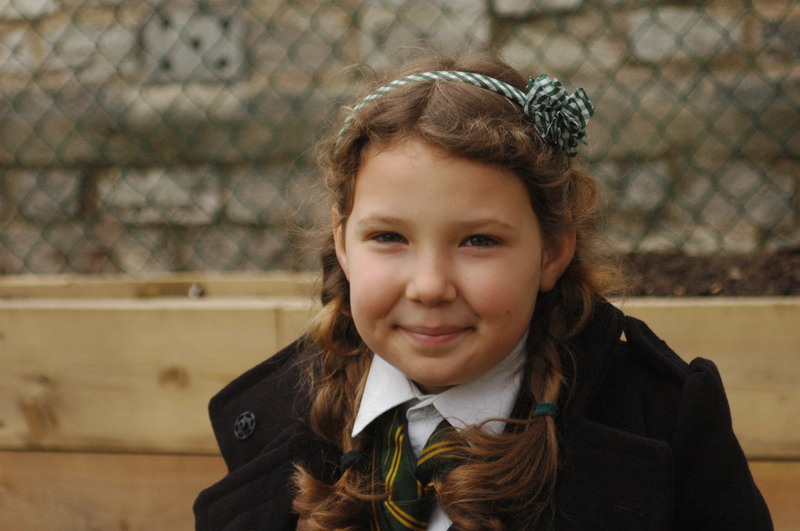 Gabriel Coyne has been involved with The Poole Passion play for the past four years, and 2014 brings her a new opportunity to play the leading role of the child. The exciting lead sees her walking the audience through the story of the last days of Jesus Christ from the perspective of a child. After standing in for the role for a number of weeks, Gabriel was eventually cast and is now very happy to be right in the centre of the story. We caught up with Gabriel and her head teacher, Richard Warren to talk to them about being involved with Dorset’s largest community theatre production. Making costumes for a play can be an exciting and daunting process. Although most of us enjoy the full power of theatre, it is often the costumes that make the experience that bit more special for us. For the fourth year running Arwell (Costume Designer), Wendy (Wardrobe Mistress) and Jill have produced fantastic period apparel fit for an angel, or an archangel at least! Each member of the costume team has an important part to play in producing the costume from when it’s first designed to when it’s first worn in a performance. Arwell turns sketches into reality, Wendy ensures that all of the costumes have secret pockets so that the actors can keep their props and belongings with them and Jill fearlessly pins fabric as the actors try on their new robes. According to Jill making costumes for this play has been even trickier than making a wedding dress! 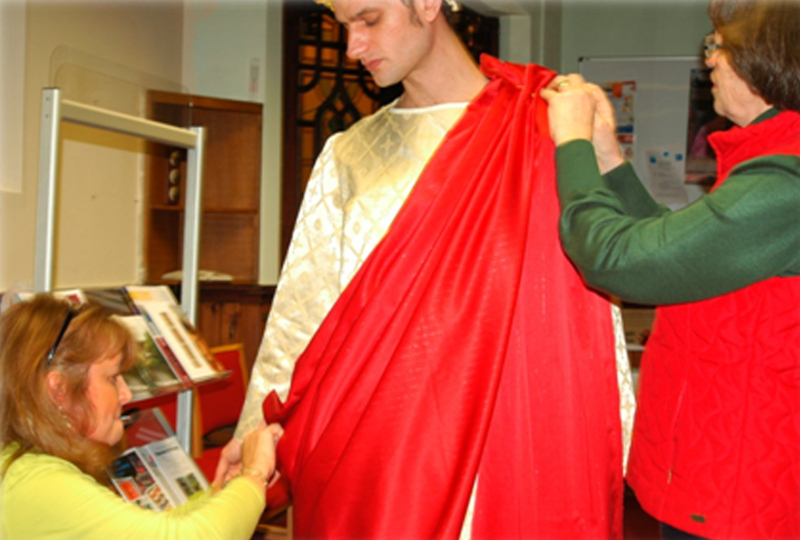 We think that the costume team did a great job with Herod’s costume in the photo above too, don’t you agree? If you like the costumes, then you’ll enjoy the play too. Tickets are on sale for April performances and are available on our ticket webpage. Don’t miss out! On the 14th of February 2014, St Peter’s Parkstone Church Choir, Poole with support from The Poole Passion hosted a fundraising concert raising money for Operation Elliot. Elliot is a 6 year old boy from Southbourne who suffers from Cerebral Palsy and severe Haemophilia A. To read more about him and to donate to his cause, please visit www.operationelliot.org. The evening started off with St Peter’s Church Choir performing The Lord’s My Shepherd by Howard Goodall, directed by Richard McLester (www.richardmclester.com), followed by the pianist David Parry, who performed Scriabin’s Op 8, No. 12. Alexandra Wehlau (www.alexandrawehlau.com) then gave a moving and powerful performance of Pie Jesu by Darufle, accompanied by Richard McLester. 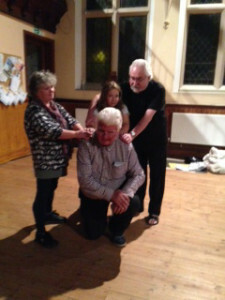 4 actors from The Poole Passion then performed a short extract from Through The Eyes Of A Child, which will be performed this coming Easter. Finally, young talented artists Luka Gadeliya (www.lukagadeliya.net) (organ) and Christina Eshba (soprano) from Abkhazia have took the audience by storm, exceeding all expectations. They created a magical atmosphere and their remarkable performances were much appreciated. Among comments from the audience were: “outstanding performances”, “absolutely amazing”, “fantastic talents”, “the best organist in years”, and “I loved every minute, it was so moving” . The whole concert was professionally recorded and will be available shortly. The Poole Passion will be supporting a fantastic classical event on Valentines evening, later this week in order to raise money for a very worthy cause, Operation Elliot. Elliot is a 6 year old boy with cerebral palsy and a severe haemophilia A. He’s just like any other six year old in many ways – he wants to be a pilot at the moment but the next best thing would be to be a pirate. Having cerebral palsy means that he can’t do all of the things that his friends and siblings do and he gets understandably frustrated as a result. He has recently been assessed by a specialist team at Great Ormond Street Hospital and is considered to be a strong candidate for a potentially life changing operation called a Selective Dorsal Rhizotomy. This is a huge spinal procedure which aims to give him much more freedom of movement. The biggest challenge is raising the funds of £60,000 for the operation and a much needed course of physiotherapy after. This where you come in. We are pleased to invite you to one of the most prestigious concerts in Parkstone this year, with all funds raised going towards Elliot’s life-changing operation. We are feeling very blessed that internationally recognised musician, Luka Gadeliya (organist) and Chritina Eshba (soprano) are granting us of their magical presence for this special concert. To top off this great line-up, St Peter’s Parkstone Parish Choir will be joining them along with the actors of Poole Passion who have a few surprises up their sleeves to keep you entertained! What more could you wish for on a Valentine’s evening? Keep your Valentine entertained with music and drama, and it’s all for a great cause! Come along and enjoy the entertainment. Free entry. Donations welcomed! 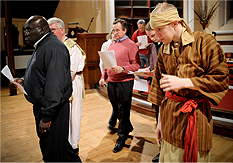 Listen to The Poole Passion interviewed by Julian Clegg on BBC Radio Solent. The interview with Stuart Turvey (Poole Passion Chairman) and Sharon Muiruri (Artistic Director) features music from the forthcoming soundtrack The Road To Golgotha written and recorded by Richard McLester (Musical Director) and Alexandra Wehlau. The opening clip of music is taken from the Overture to the Play called Lament of the Shalmaj, with a haunting melody played by Richard on a 15th Century Shawm. The second clip used in the interview is taken from the scene when Jesus agonises in the Garden of Gethsemane before his arrest. I expect that most of you know by now that our dear friend Christopher Mellows died peacefully yesterday. Not only was Christopher a great actor and played the role of Herod so well but he was a wonderful generous and a lovingly human being. Someone who was a good listener and always made people feel happier after they spent time in his presence. 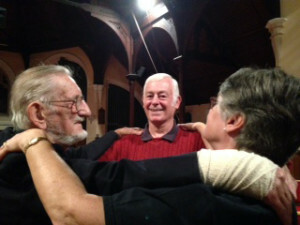 He was a tower of strength in the group. 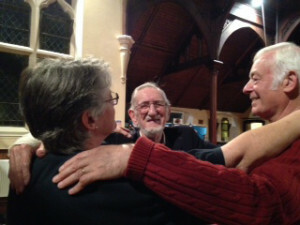 He was at the very first meeting of the Passion Play back in 2008. From that meeting onwards he gave terrific commitment time and energy to the project. We shall never forget him and will continue to feel his warm and guidance around us. Our love goes out to Helen and all his family and especially to Sam his son and Rhys his grandson who were also involved in the play. I joked with Chris it was a bit like having the ‘Redgrave dynasty’ in the play. Christopher was always ready to make us smile and we shall all miss him deeply. Producer Jan Miller and Artistic Director Sharon Muiruri went up to Leamington Spa for Passion Play Conference. It was a really interesting day particularly from a networking point of view Sir Jack Stewart-Clark gave the keynote. He and talked about being Producer of the Life of Jesus Christ Plays, Glasgow and at Dundas Castle, Scotland and interestingly his project in Louisiana State Penitentiary. 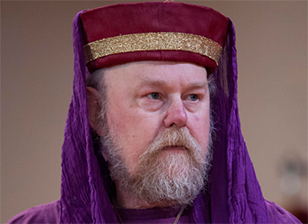 We also heard form James Burke-Dunsmore, well know for playing “Jesus”, he talked in particular about the Brighton and Wintershall plays. It was a very useful day for us . It made us feel confident that we were in a good place with our own project, not in a complacent way, but in a positive way that we are forming a something special in Poole, Dorset . Two FREE Workshops Coming Up! Two FREE workshops open to everyone of all ages. Both Workshops will take place 5:45pm – 7:30pm at Parkstone United Reform Church, Commercial Road, Poole, BH14 0JW. For more information, please contact us via our contact page – click here! 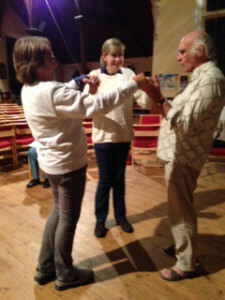 Ps, Please don’t be put off by the word dance! If you do not feel you can physically join in we would still love to see you… We have a lovely group of people who you can be with – so do not feel you will be on your own! Refreshments and tea provided. View both workshops in our online calendar – click here!